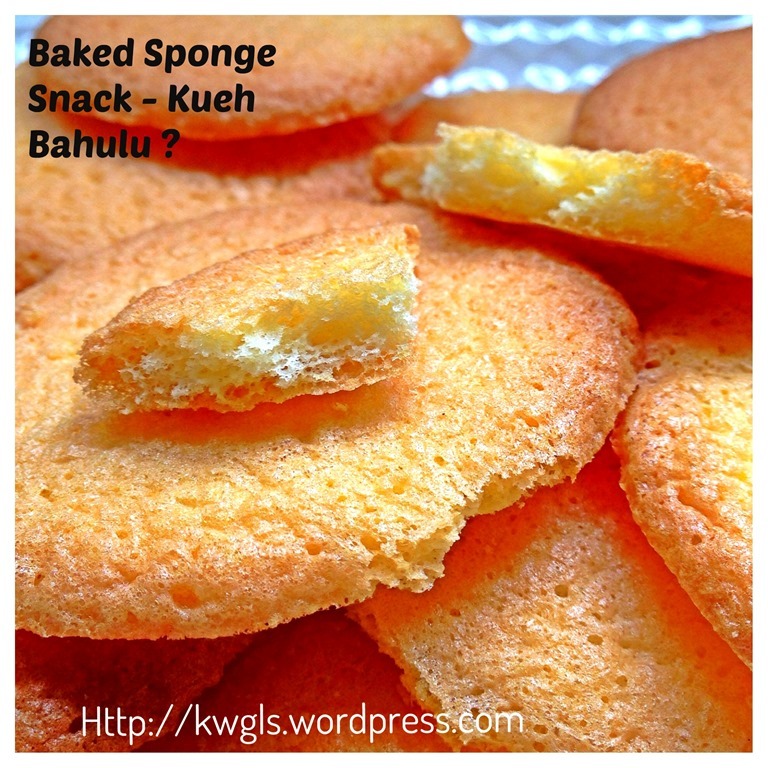 Just before Chinese New Year, my cleaner helper asked me if I want a Kueh Bahulu mould. She said another household wanted to throw away the mould and since she knew I like baking, she offered to bring it for me. As I knew this type of mould is not commonly on sale now, I told her that I am more than happy to keep the mould. She brought me this mould just a few days before Chinese New Year and I did not have a chance to prepare this snack before Chinese New Year. Therefore, I have decided to toy with this bronze mould today. 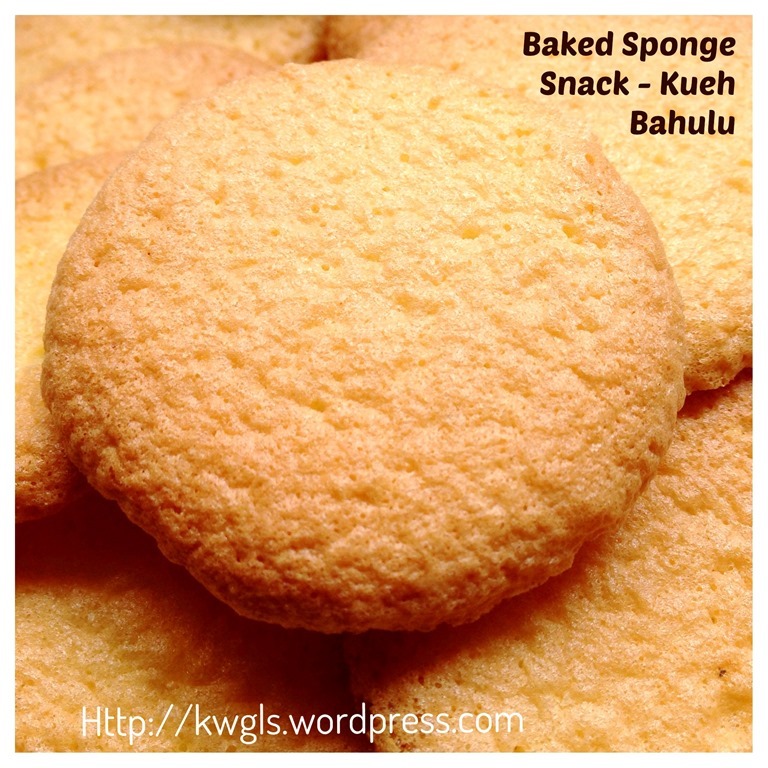 I am baking some Kueh Bahulu – a traditional Malay snack. 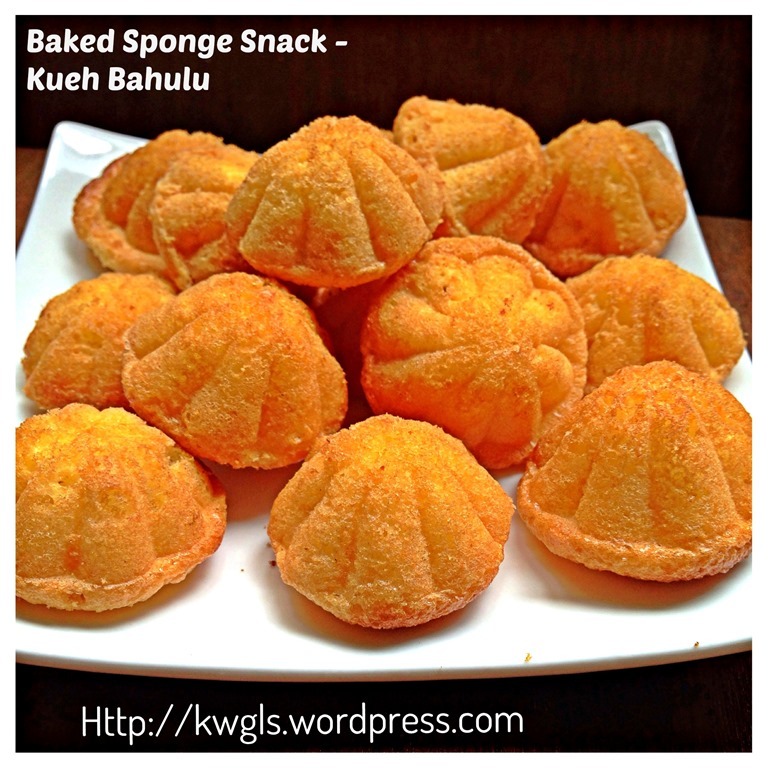 Kueh Bahulu essentially is a type of sponge cake or baked Kueh Neng Ko. Ingredients are very simple comprising only eggs, sugar and flour. 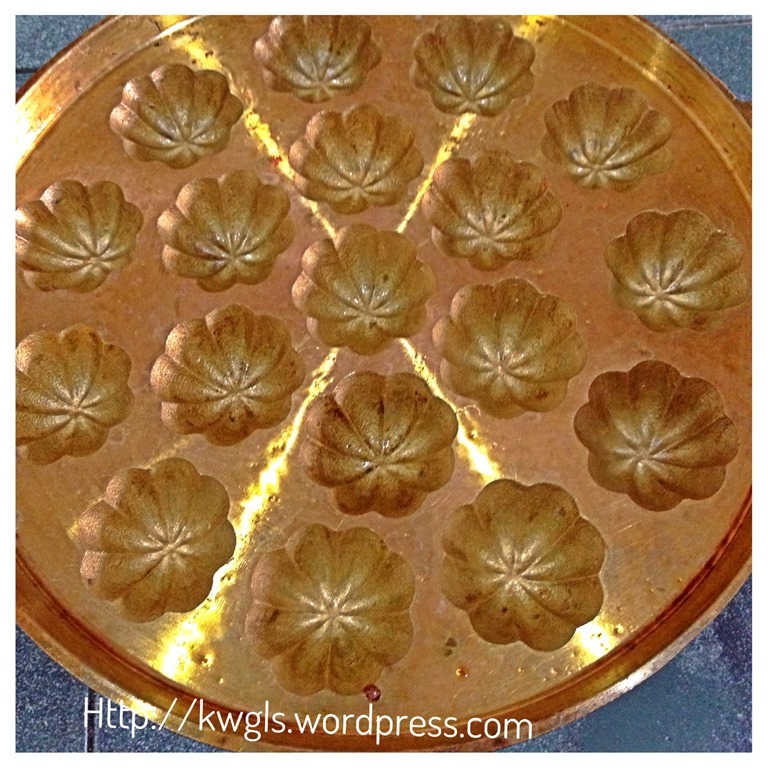 It is the baked version of the steamed sponge cake that were usually used for praying ceremony but differ in size, shape and preparation method. If you are interested to understand more about the steamed version of sponge cake, you can refer to this post: Back To Traditional Recipe of 1egg：1sugar：1flour- Traditional Steamed Sponge Cake (古早味鸡蛋糕）. Preparation is almost the same, beating eggs to light and pale and fold in the flour as light and as swift as possible. 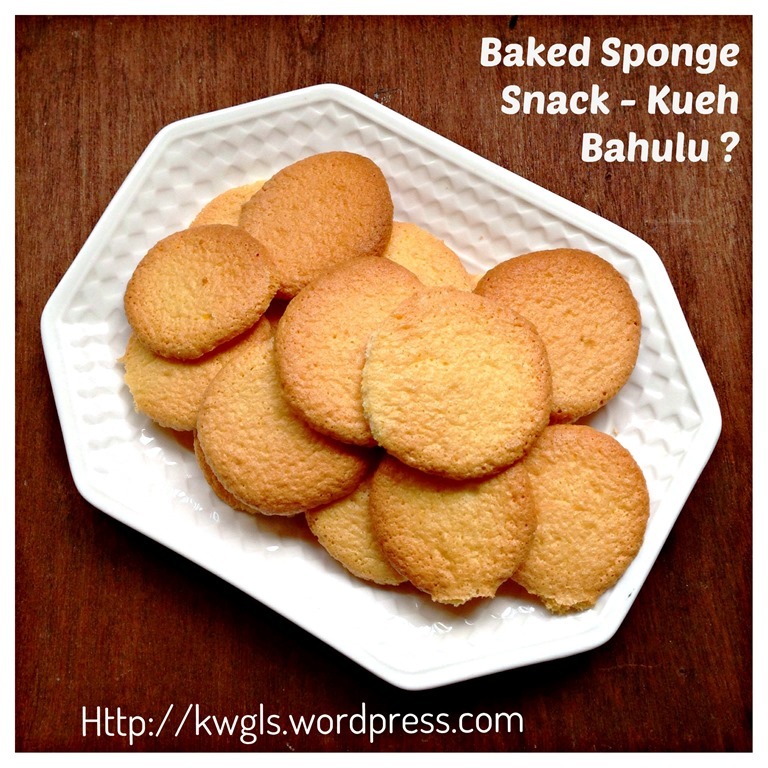 Realizing lots of readers may not have the Kueh Bahulu mould which is rather difficult to get now, I have decided to experiment if it can be baked in other shapes. I just dropped some spoonful of the batter to a baking tray with parchment paper. I baked and it becomes very crispy like a type of thin biscuits. It is addictive and I finished all that I have prepared during the first bake. I love it so much that I have decided to specially prepare another 2 eggs for this macaroon looked alike Kueh Bahulu. You can go an extra step to stir fry or oven bake or sun dry the flour for a few hours before preparing the Kueh Bahulu. You will also need to bake the bottom for additional few minutes to force out the moisture trapped at the bottom of the mould. 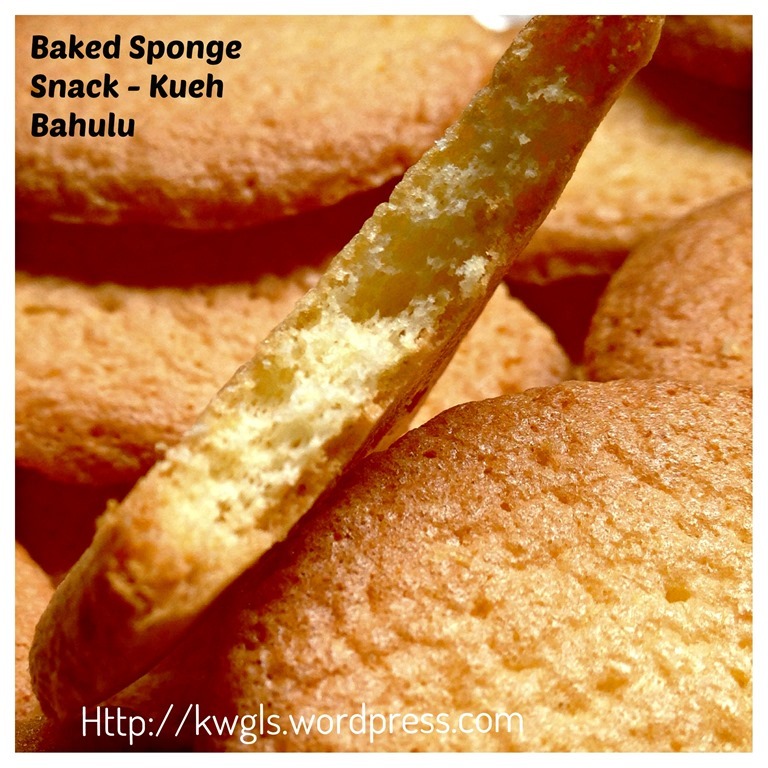 There is a need to completely cool the Kueh Bahulu before store in a container, otherwise, the water vapour will be absorbed back to the Kueh Bahulu making it a bit chewy. To make it crispy again, re-bake in the oven (at about 100 degree Celsius) or oven toaster for additional 3-4 minutes. It will become crispy again. 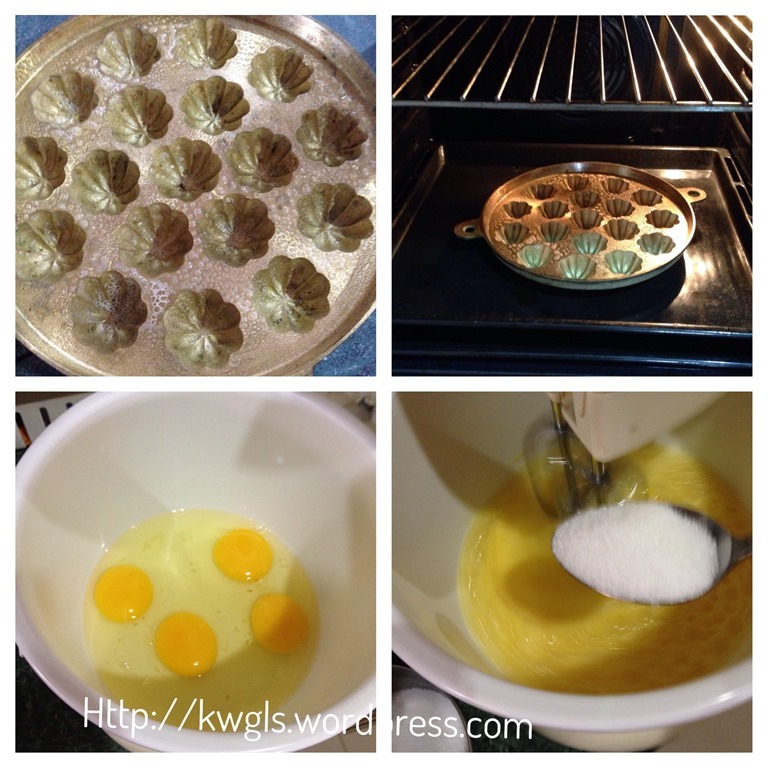 Lightly grease a Kueh Bahulu mould and pre-heat the oven and the mould at 200 degree Celsius. In a mixer, beat the eggs and vanilla essence until foamy and gradually add in the sugar. Beat until the volume expands to at least twice to three times the original quantity. In this process, you will witness the egg volume starts to expand, getting paler and paler. It will also become stickier and stickier. Once ready, ensure that egg batter drips down rather than flow down towards the mixer. Carefully sift in 1/3 of the flour. Use a spatula to stir until well combined. Repeat the same for the other 2/3 of the flour. 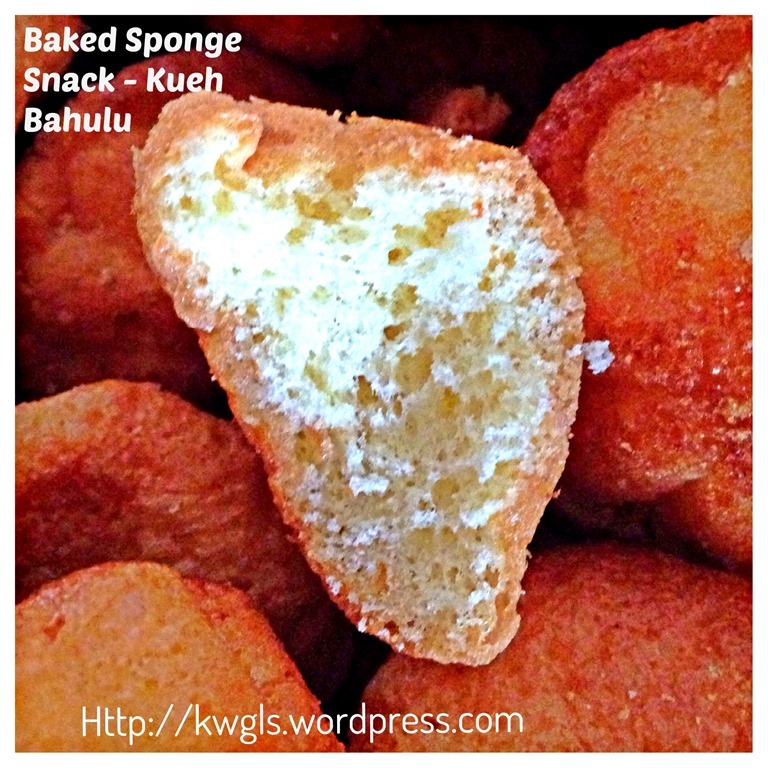 Fill the Bahulu mould with the batter and bake in the oven for 8-10 minutes. If you want crispy version, Use a satay stick and take out the Bahulu and ensure that the bottom is facing up. Send back to the oven and bake for another 3-4 minutes (or until your desired texture). Let it cooled completely before store in the container. 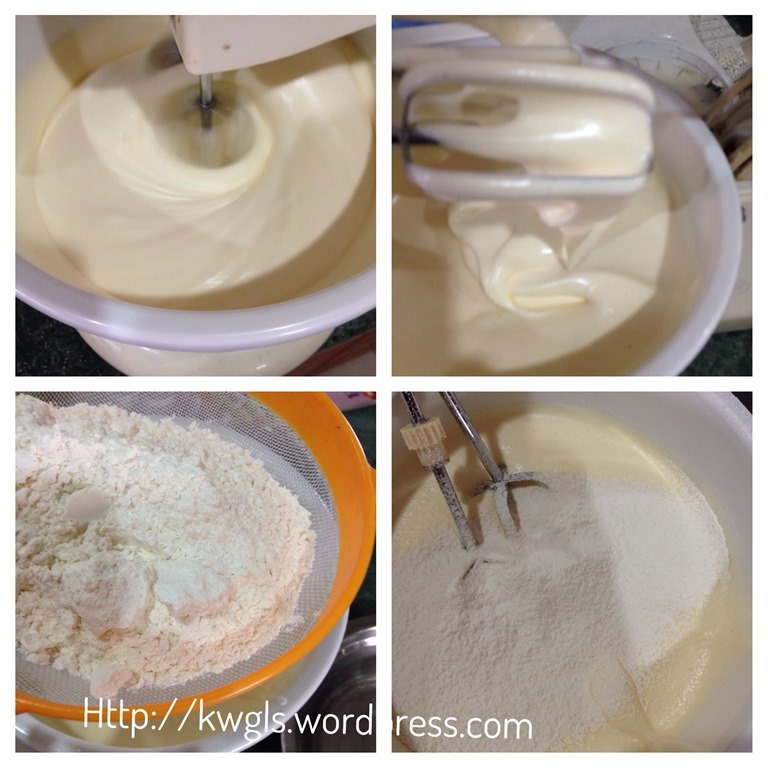 If you do not have the Kueh Bahulu mould, try the following method. In a baking tray with parchment paper, drop a teaspoon of batter on top of the baking paper. Knock the baking tray against the table top to get rid of any trapped bubbles. (Note: A well beaten batter should not spread like liquids, it should spread rather slowly. In addition, like macaroons, you can draw some circle in the baking paper and transfer the batter to a piping bag. Pipe the batter inside the drawn circle.) Leaves adequate space for expansion (about 1 finger wide). Bake in the oven at 180 degree Celsius for 10 minutes or until the top part turn golden brown. 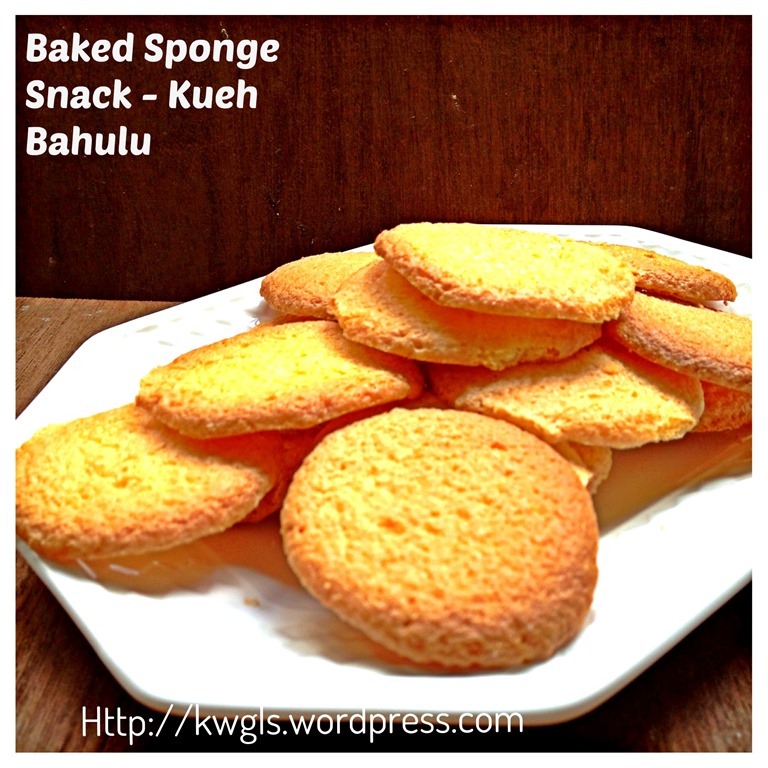 To ensure crunchiness, turn the Kueh Bahulu and baked for another 3-4 minutes. (Note that like cookies, it will be slightly soft when hot). Cooled completely on a wire rack before transfer to an airtight container. This post came a bit late. It should be issued before Chinese New Year. 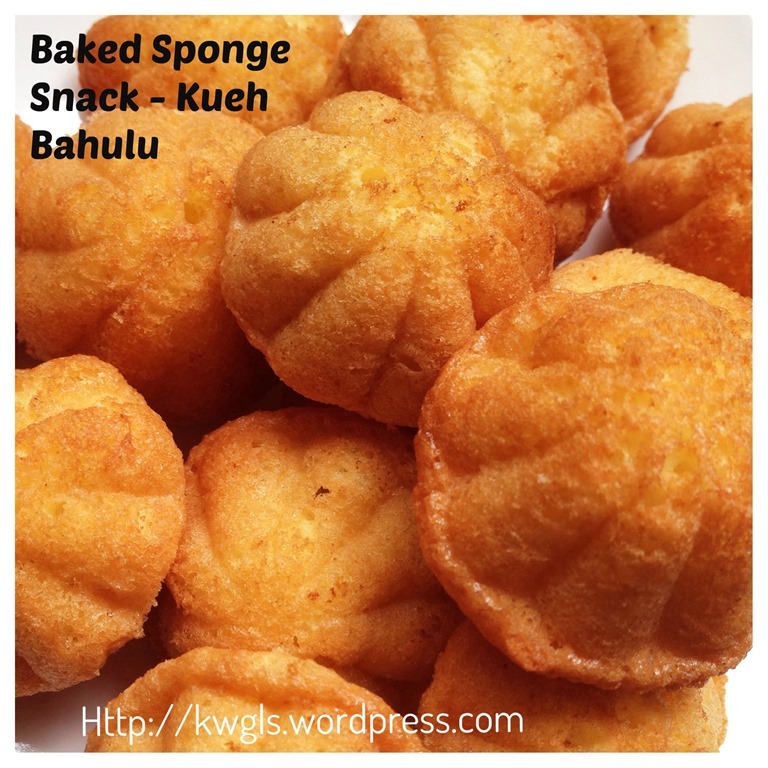 However, since Chinese New Year is over and if you are still thinking of Kueh Bahulu, you may want to try baking it using the above 3 ingredient simple recipe. 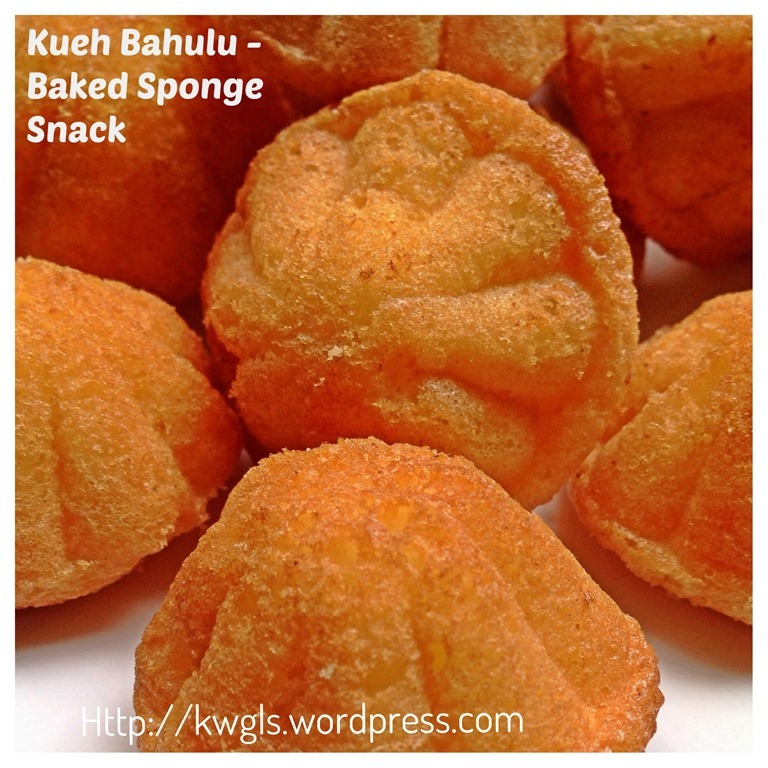 If you do not have a Kueh Bahulu mould, do try the macaroon looked alike version. It is equally tasty. Personally, I like the macaroon look alike version.. 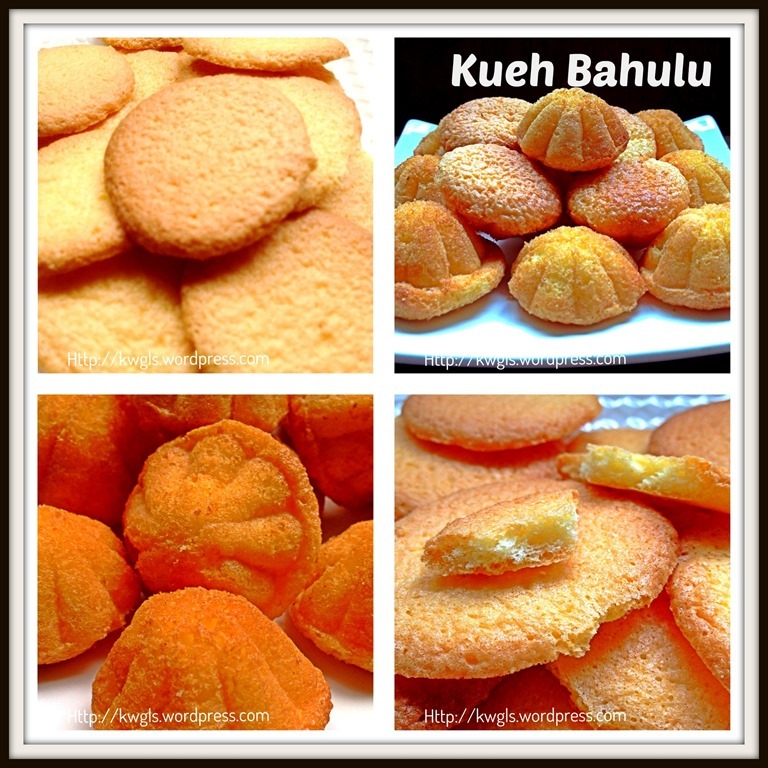 Remember the few points mentioned if you want your Kueh Bahulu to be crispy. If it become stale, send back to the oven again at low temperature (100 degree Celsius) and re-bake for 3-4 minutes, it will become crispy again.. 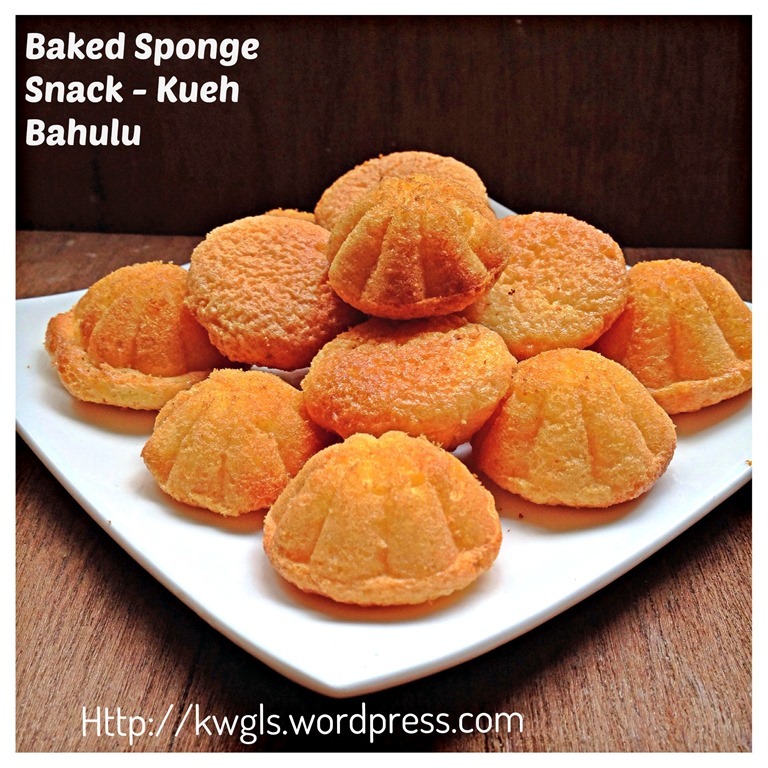 This entry was posted in Cakes and cookies, Chinese and Asian Cakes and Snacks, Chinese New Year 2014, Food Preparation Series and tagged 8, crispy kueh bahulu, GUAI SHU SHU, Guaishushu, kenneth goh, kueh bahulu, kueh baulu, kueh bolu, postaday. Bookmark the permalink. Can I use a muffin mould? You can try but don’t put too much, may be a tablespoon . Unless you want to make it into cupcake, it will not be crispy . 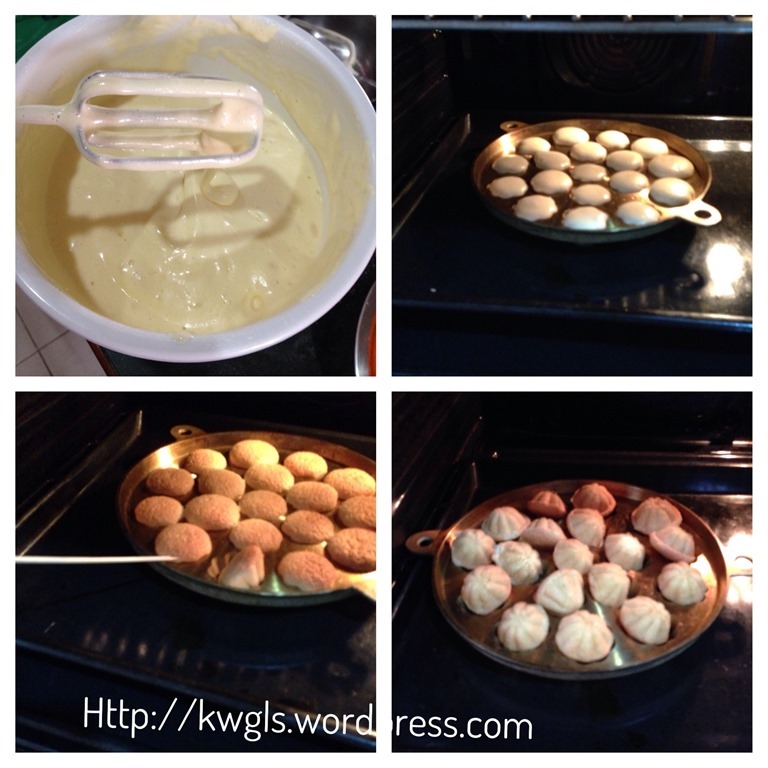 Since it is cup cake size, it can be dry, therefore you may need to add say 30g of cooking oil to make it smoother. I have a mini muffin mold that may work for these. I’ll have to try them soon and let you know. If it doesn’t work, I crisps would be great with my morning tea. Pinning for later. 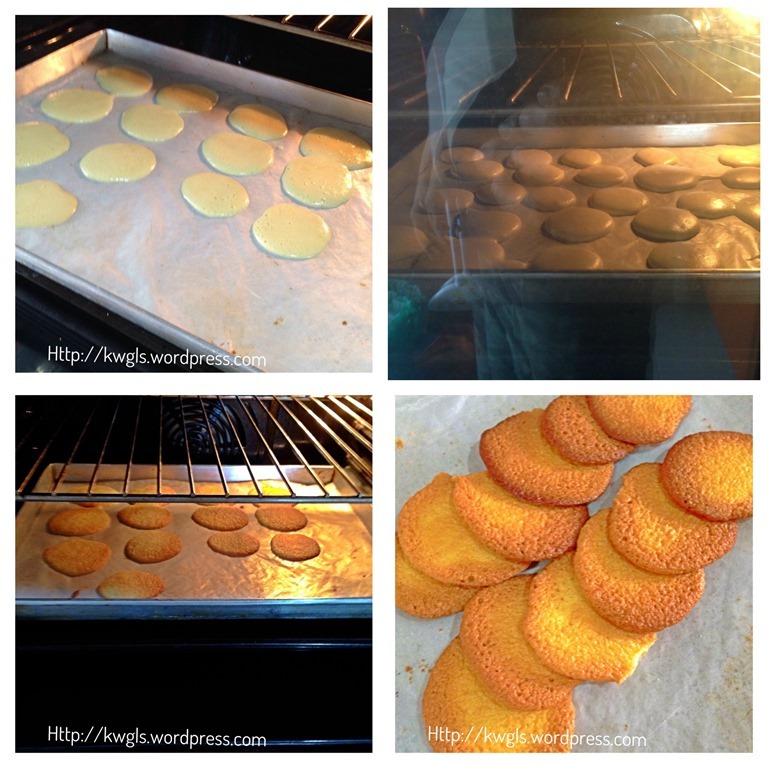 Hi Kenneth, I just finished baking the macaroon look alike version, very cruncy n nice. Thks a lot! 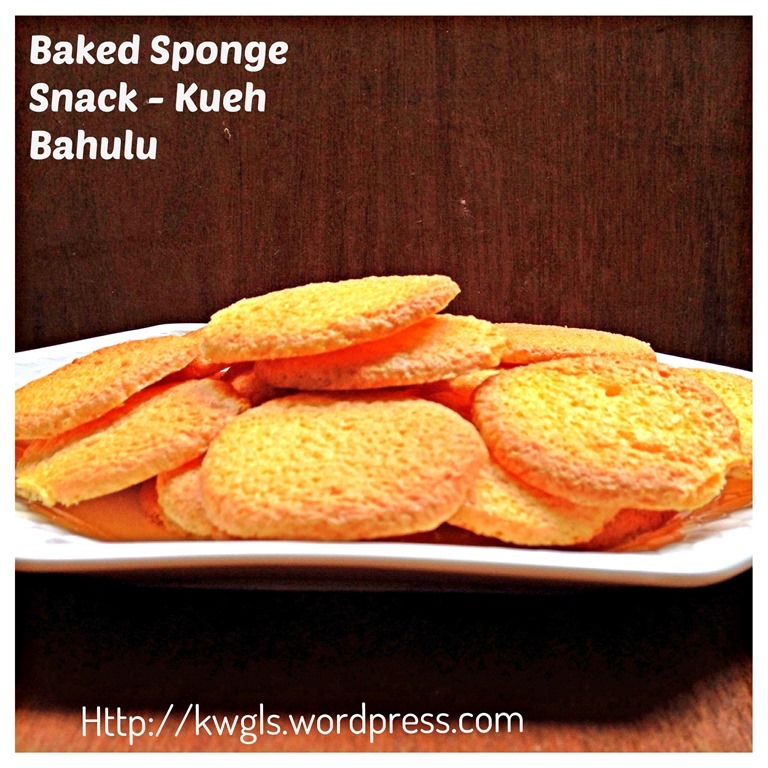 Really love all your easy baking version n will slowly try them. Traditionally, it should be plain flour. 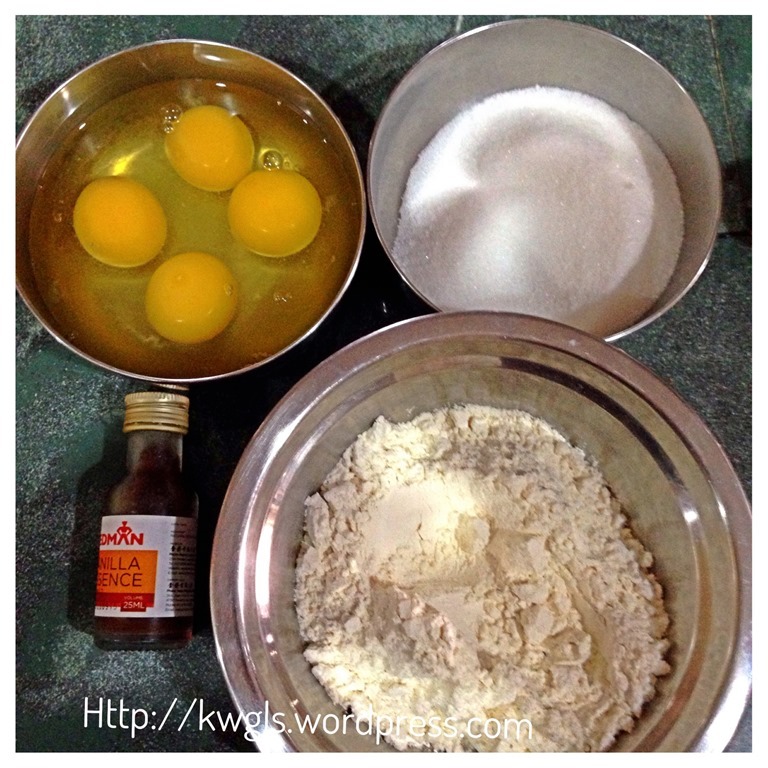 It is possible to use plain flour since egg is a raising agent by itself..
Hi Kenneth, thank you for this easy recipe. I will bake another round nearer to CNY. Today’s batch will be gone soon. Since I don’t have the Bahulu mould, I used the mini maffin mould. It is my first time making it and it is a bit dry, is it how it should be? I look at the recipe and it is similar to the dutch eierkoek but my husband said that this taste better. I wonder where I can get the mould? Unsure where you are. In singapore, lots of bakery shop do have though it is not bronze like what i have now. you can add some cooking oil to make it “moister”. Hi Kenneth, I would like to try out this recipe but one question. Since it will take a couple of minutes to bake each batch, will it the remaining batter or those waiting to be baked deflates. Because the batter is something sponge like, can it wait so long and will it affect the after bake result? Thank you. Never encounter such problem before. It should not be .. how about those commercial or home baker who make large batches? Kenneth, have you tried it with this little gadget? I tried making Thai cakes in it.